The first of four (4) Central Service Area Projects began in September of 2016 and the final project covered by this blog was completed in January of 2018. In all, over 7 miles of new recycled water pipeline was installed and an existing reservoir tank was refurbished with enhanced seismic protection. The contractors enlisted to perform the work provided crews dedicated to the safety of the community. water consumption by 65 million gallons per year! We understand that construction can be an inconvenience, so we wanted to take the time to say "thank you for your patience." Collectively, the projects under the North Bay Water Reuse Program such as these will help reduce potable water consumption by 65 million gallons per year. 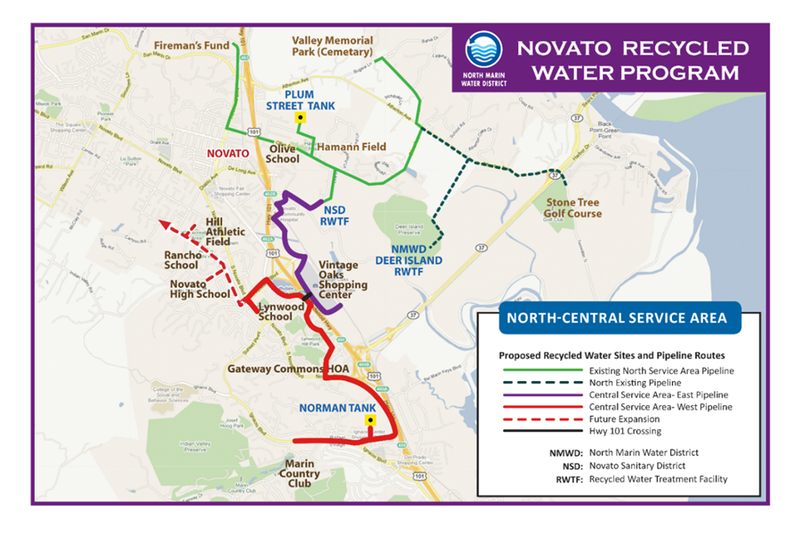 By providing high quality, drought-resistant water sources, the North Marin Water District aims to enhance the beauty of Novato in an environmentally smart and sustainable way!